It's been a super busy week for me and my Otaku House. Hell, the entire month has been busy. Not only have I been stocking up on some badass anime collections and some cool merch, but I've also been to the movies to watch the kickass Dragon Ball Z: Resurrection 'F' three times in the last week and a half. It really is a movie for the fans. Of course, it's not a perfect movie, but it's a great movie-going experience and well worth the three trips to the theater for me. I highly recommend going if you can before it stops playing. Funimation is giving an encore run until August 17 so check your local theaters. Dragon Ball and Dragon Ball Z fans really are some of the best fans in the world and each time I went my fellow fans made me proud by turning out in some respectable numbers and in their favorite shirts. Way to represent. Of course, this entry is a review of where it all started: the manga. Goku had a long, long way to go before achieving the anime greatness of Super Saiyan God. In this volume Goku and his gang have their hands full with the mighty Red Ribbon Army. General Blue is hellbent on getting his hands on the dragon balls and so he chases Goku, Kuririn, and Bulma into an underwater cave that is said to lead to a fantastical pirate treasure. What follows is a section that seems straight out of Raiders of the Lost Ark. Goku and company go down corridors lined with booby traps in an effort to escape their pursuers. Of course, the comparison kind of goes away once the giant robotic pirate thingy attacks. Just who the hell were these pirates? While a serviceable bit of story, I once again felt that the Red Ribbon Army just isn't that terrifying of a foe. Sure, Goku is a bit naive and falls for some cheap tricks, but General Blue really isn't much of a threat for Goku. It's odd that Blue actually survives this entire volume. I never really thought of him as a major villain, but he's had over a volume dedicated to him at this point and with some more to come. Then again Toriyama really is just an off the cuff kind of guy and he makes stuff up as he goes, it seems. Blue may be the top villain for now, but he won't stay there for long. After the pirate treasure chase, Goku ends up chasing General Blue into Penguin Village where the characters from Dr. Slump greet them. Of course, this series was started after the end of Dr. Slump so I imagine this cameo was definitely neat for fans of that series. There really is nothing like reuniting with old friends. 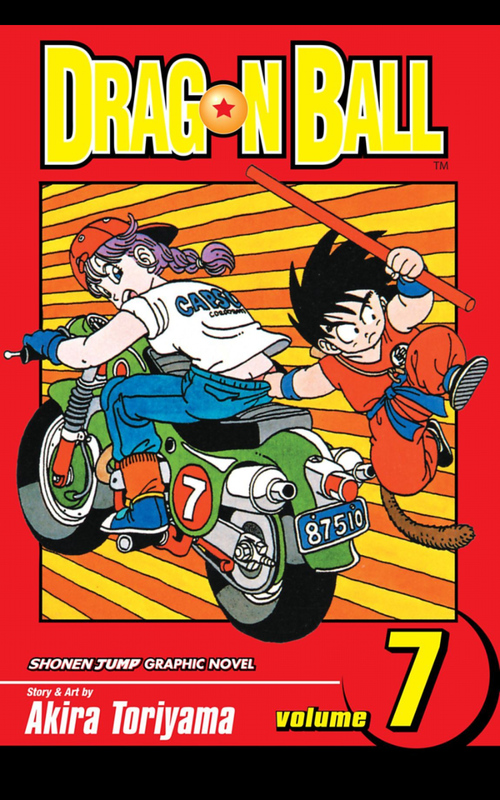 However, if you aren't familiar with Dr. Slump then the cameo falls really flat. I knew about it because I read a read an Amazon review and then picked up the first two volumes of the Dr. Slump manga beforehand. Dr. Slump frequently breaks the fourth wall as part of its humor. The main character (other than Arale) Norimaki Senbei says how excited he is because it had been so long since he appeared in a comic as he knowingly winks at the audience. I imagine, he'd be even more thrilled to appear in one today since this volume debuted in 1987. This style is a bit different than Dragon Ball since Dragon Ball tries with each successful volume to be a bit more serious. The cameo is certainly cool, but not really necessary for the enjoyment of either series. It's really only a moment for fans of both and I imagine it will be lost on many Western fans that have no idea what Dr. Slump is. 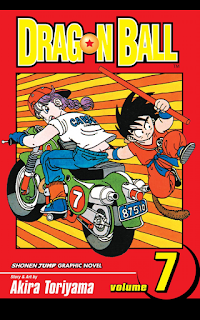 The volume ends up with Goku's journey to Karin's Sanctuary where he hopes to find another dragon ball after General Blue has decided to make a temporary and wise retreat. The Red Ribbon Army hasn't given up, though. Commander Red has decided to send the illustrious Taopaipai after Goku. Will Goku survive that battle? Well, duh, but I'll pretend I don't already know the outcome and eagerly start the next volume.